There is one teacher for every 35 students in Indian secondary schools, and 95% of our engineering graduates are unemployable. The student loan defaults increased at 2.5x between 2013 and 2016 to $1 billion. Finding the right mentor and the right content that's tailored to your learning style and background is extremely challenging, but that can make or break your learning path. And there is a dearth of quality 1-1 guidance at scale in countries like India. If you're curious about something, the first thing you'd do is Google it. And it would return a general set of results that aren't contextual. The next thing you'd do is go and talk to peers, friends, professors, or others in your network. A lot of valuable time gets wasted in getting to that one simple explainer video, or that one lecture you'd been looking for, that's just right for you. High speed data costs are falling rapidly, and more people are gaining access to mobile Internet. At the same, tuition at universities is growing exponentially, and students are exploring cheaper and more accessible ways to learn. The amount of educational queries in tier 2 cities has seen a 46% year-on-year growth. It all began when one day, during a conversation, a friend happened to share what appeared to be the exact same problems I was facing as an autodidactic learner. We started brainstorming ideas and talking to people to gauge and validate the problem, and putting together a team of multidisciplinary professionals to work on this. We started having a dialog over public groups and visiting schools to understand the needs of learners like us. We brainstormed for weeks and defined our core concept. While I am the only designer in the team, my co-founders are educators and scientists. I started sketching out the product and building quick prototypes in Sketch, while continuing to iterate the features and core concept. The rest of the team got to work on the data science and engineering of the site, and mapping the World's knowledge. Considering a user's learning style (whether they prefer short explainer videos or nuanced articles), history with the subject (whether they're absolute beginners, hobbyists, or trained in the subject), and interests is extremely important to providing the most relevant results. We wanted to offer a simple 3 step flow. 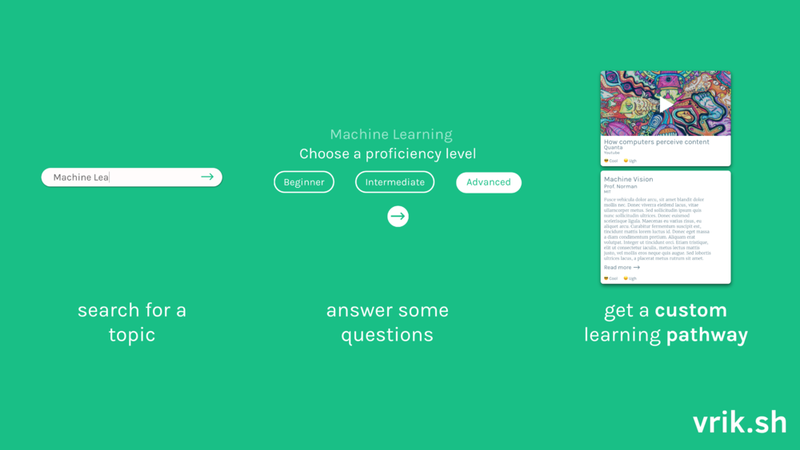 The user queries for a topic, answers a set of questions about their learning profile, and gets served a custom learning pathway. We began testing a WhatsApp-based recommender system and testing the idea with people in our network earlier this year. We intend to A/B test an initial build of our product in local schools over the upcoming academic year beginning in June. We are currently working on building the first version and an extensive user study to gain further insights.